You can use Twitter through your Droid X to share your existence with others or simply to follow what others are up to or thinking. You can create a Twitter account by using your Droid, but it’s a lot more work that just using a computer. 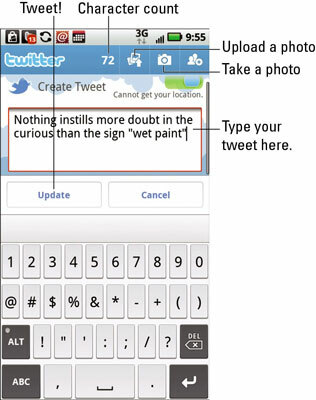 After you create a Twitter account, use the Twitter app on your phone to view Twitter updates or to tweet. A good Twitter app was developed by the Twitter people themselves. The Twitter app is free and available at the Android Market. To read tweets: Choose the Tweets item. Recent tweets appear in a list, with the most recent information at the top. Scroll the list by swiping it with your finger. 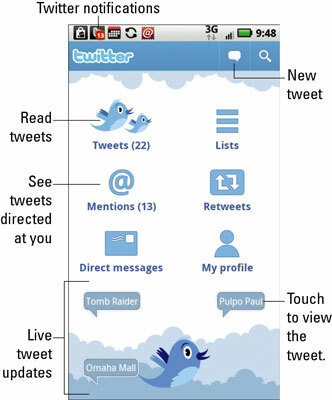 To tweet: Touch the New Tweet icon. The Create Tweet screen appears. For a basic tweet, use the onscreen keyboard to type your 140 characters or less and then tap Update. You can also upload an image from the Gallery or take a new picture and post it to Twitter.